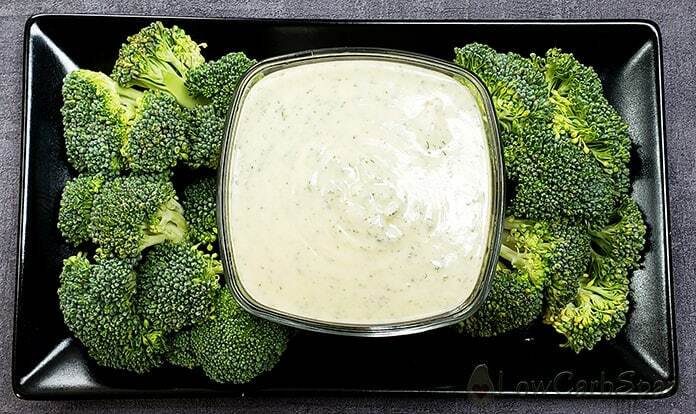 Keto ranch dressing is a flavourful addition to your veggies, a great low carb dressing for salads and the perfect dip. It will take less than 5 minutes to make, and it’s better than any store-bought dressing. 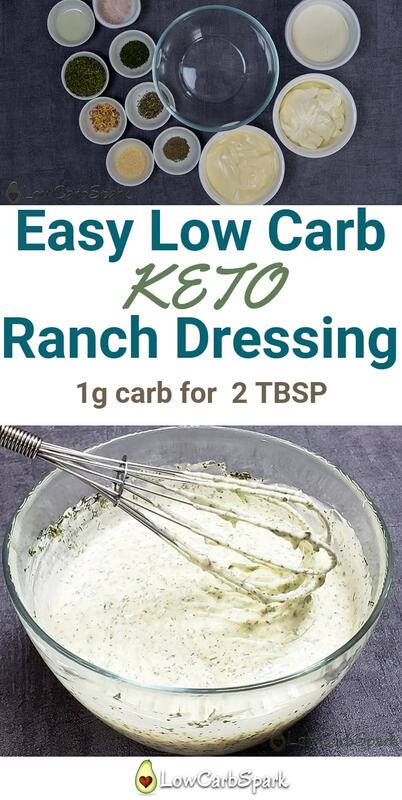 This keto ranch dressing is a staple in our kitchen because, in my opinion, it goes well with almost everything. It won a permanent place in my refrigerator, and I enjoy it more than any other dressings. It’s a great way to increase the fresh vegetables you eat when you know you can definitely change their taste with a fantastic sauce. I love dipping keto pizza in ranch, and my spicy fried chicken bites are fantastic with a side of ranch. After making this recipe, you’ll instantly become a fan and use it as a dressing for all the salads and as a dip for all the raw veggies you love. 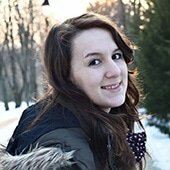 What ingredients do I need for the keto ranch dressing? 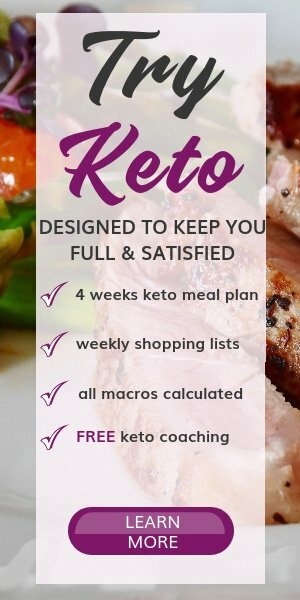 To make sure that you’re using the right keto ingredients you’ll have to start by reading the ingredients list on the mayonnaise because most of the store-bought jars have added sugar and are made with unhealthy oils. First of all, find a mayonnaise that’s made with olive or avocado oil for a healthier option. 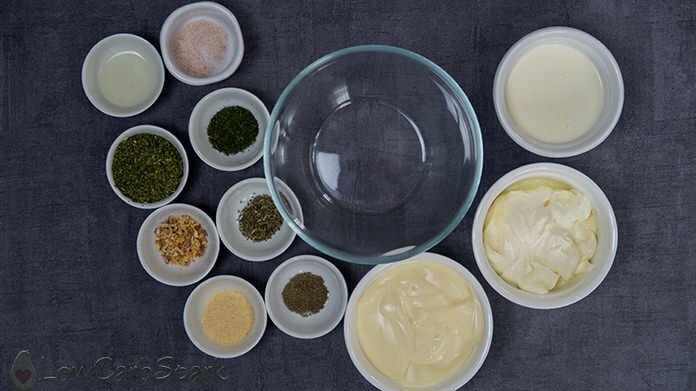 It would be great if can use a homemade mayonnaise, but if you want to save some time grab one that doesn’t have any sugar listed in the ingredients. Secondly, gather all the spices. This keto dressing is so easy to make and has less than 1g of carbs for a tablespoon. In fact, it has 0.5g and you can have 2 tablespoons with no worries. Because we are using sour cream and heavy whipping cream along with the mayonnaise, we’ll result in a creamy dressing balanced by the acidity in the lemon. You can substitute the lemon with vinegar too. For a printable version scroll down until the recipe card, and you’ll find there a “print” button. 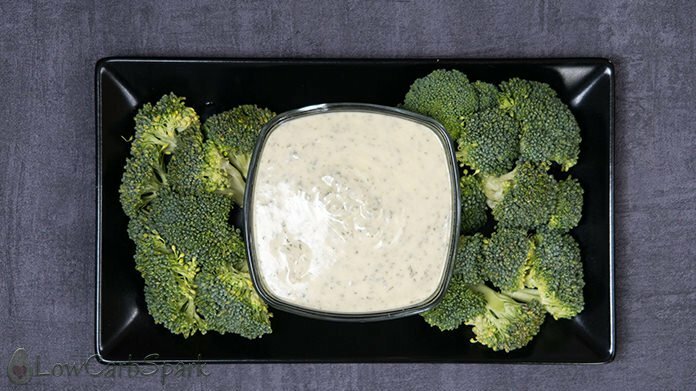 My low carb ranch dressing is packed with flavor and has a little kick from the freshly squeezed lemon juice. 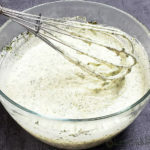 How to make keto ranch dressing? Gather all the ingredients and spices. Grab a bowl and whisk together all the ingredients until well combined. There’s no right or wrong way of doing this. You can always adjust the taste by adding more salt or any spice you love. Pour the dressing into a jar and keep it in the refrigerator for at least one hour before serving to allow all the flavors to come out. 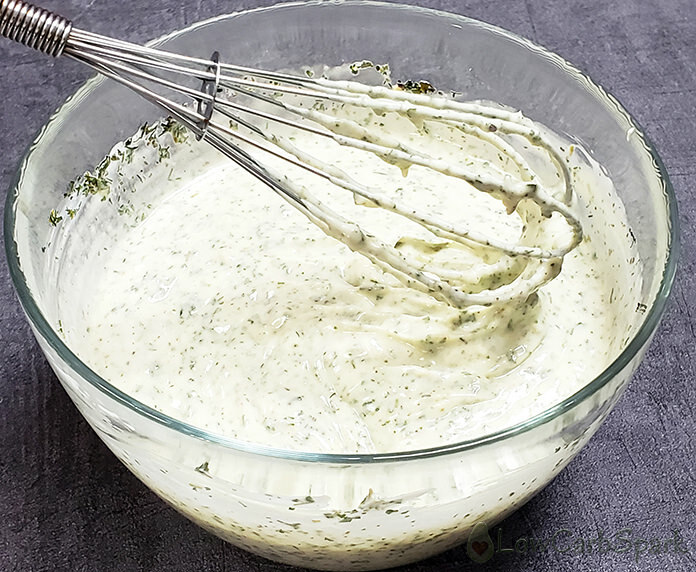 Keto Ranch Dressing with dried spices is a flavorful 1g carb dressing to salads. Ready in 5 minutes, it's very low in carbs and high in fats. In a medium sized bowl add all the ingredients and whisk well to combine. Pour the ranch dressing in a mason jar and store in the refrigerator for at least one hour before serving, so all the flavors come out. Keep the dressing in the refrigerator for up to a week. Enjoy!